"It doesn't really matter what you believe, just as long as you believe something." We've all heard statements like this somewhere along the way. Or, we've heard that it doesn't really matter if someone believes or doesn't believe that Jesus is the Lord. If those sentiments were true, there was no need for Jesus to go back to that Upper Room a second time. I mean ten out of the remaining eleven apostles believed Christ. That's a pretty good ratio. And besides, if it doesn't really matter what one believes, why not call it a good day and forget about Thomas? Jesus did go back to that room. He went back out of a merciful love for Thomas. 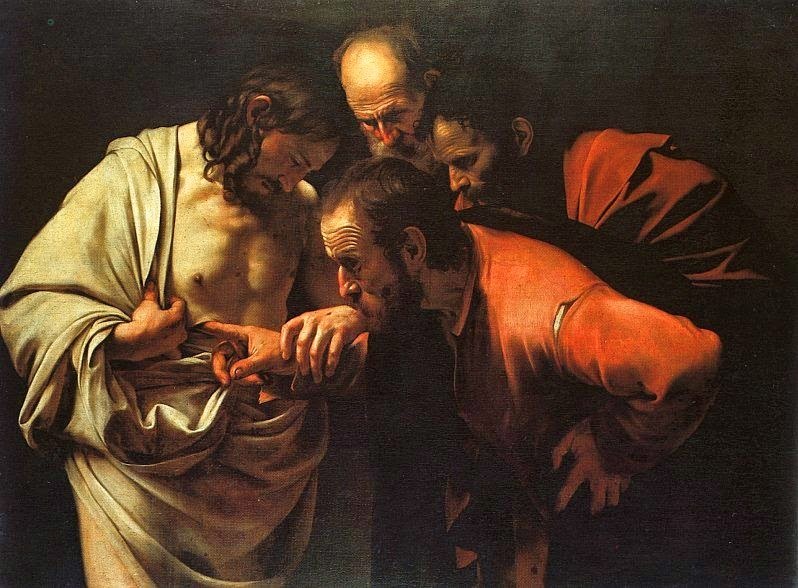 Jesus wanted Thomas to believe so that through belief, Thomas could have life. What we believe matters. Who we believe matters. Now sometimes, we find ourselves trying to sound all cool by saying, "Well, I'm like Thomas. I'm a real doubter." No! When Jesus came back to that upper room, he didn't say to Thomas, "Hey nice going Tom. The rest of these guys all believed me, but you are much brighter than that. Good job on being a doubter." Jesus says, "Do not be unbelieving, but believe." Jesus doesn't want us to be doubting Thomases. He wants us to be believing Thomases! This passage is recorded in the Scriptures not to encourage us to remain in a perpetual state of doubting, but to move us from doubters to believers. Believing someone is a beautiful experience. When somebody believes us, it really is a wonderful feeling. Without seeing for themselves, they simply trust our word. We love when people believe us. And when somebody doesn't believe us, doesn't drive you crazy? If somebody says, "Oh yes, I believe you. I just want to see it myself," the translation of that is: "I don't believe you!" In the Christian life, we are constantly called to move from doubt to belief. Eventually, we will no longer be believers. Do you know that there are no believers in heaven? That's because the people in heaven see. They no longer believe because they see. The other day I married a couple. Now, in some ways, it would be a lot easier if the couple could unscrew a little cap in each other's head and look inside to see, "Oh yeah, there it is. The love meter says that she really loves me." But that isn't how it works. That couple I married the other day spoke words to each other: "I will love and honor you the rest of my life." Each one spoke those words because they believed each other. There is something so beautiful about that. When it comes to Faith, we are believing God. That's really beautiful. St. Peter reminded us in the second reading that sometimes, we have to believe amid much tribulation. When our Faith is challenged by the turmoil that afflicts us, this is an opportunity to live an even deeper faith! This is to say, "I don't feel like believing, but I am going to because Jesus is trustworthy." Sometimes, we wish that we could figure it all out, see it for ourselves plainly. We sometimes find ourselves saying, "Well, if somebody could prove it to me scientifically, then I'd believe." But this is not belief. When I talk to kids about this, I sometimes will say to them, "I don't believe that any of you are sitting here right now." Actually, I could say that to all of you here in the chapel. I don't believe you are here. Why? Because I see you. I don't need to believe it. I see it. But, if I were somewhere else, and one of you came to me and said, "There are two hundred students waiting for you at the chapel for Mass," I'd have to make a decision. I'd have to decide if the person telling me this is trustworthy. We also sometimes think that if only Jesus would appear to us like he did to Thomas, then we would believe. But, there is something really important that we often overlook in this Gospel account. Jesus appears to Thomas and says, "Here I am. Stick your finger into the nail marks and put your hand into my side." (I've always found this a little gross.) Thomas, however, sees one thing but believes something much more. Thomas sees his old friend Jesus raised from the dead. This could have been some miracle that had occurred. (Much like the miracle of Lazarus). Thomas saw his old friend Jesus risen from the dead, but he didn't exclaim, "Hey, it's my old friend Jesus and he's alive!" That would have been a reasonable thing to say. No, instead he says, "My Lord and my God." There was nothing in that scene that proved that Jesus was God. Granted, Thomas was given some special gifts, but he still had to come to believe. He had come to faith. My Lord and my God. What we believe and who we believe matters. In his mercy, Jesus comes to us again and again and offers us the chance to move from being doubters to being believers. He does this so that we can have eternal life. When we believe, we believe Him. We believe that he is "my Lord and my God." On this Feast of Divine Mercy, let us remember that Jesus' mercy is given so that we can have life and this life comes to us through Faith in the crucified and Risen Jesus; the one who is Lord and God. About a month ago, a Boston University student was killed while home on Spring Break. Today, some members of his family, some of his classmates and friends, and members of the BU Community offered Mass for the repose of his soul. I do not usually preach from a written text, so here is the homily as best I can recall. Last Saturday night, this chapel was in total darkness until this Paschal Candle--burning beside me--was carried inside the chapel. I am struck by the fact that although the candle illumined the chapel, the darkness somehow still remains. In a way, the candle sheds light on the darkness. It allows us to see in the darkness, but it doesn't all at once eliminate it. Today, all of you who know and love Diego come here and are burdened by his tragic death. You are filled with sorrow and feel the pain and the agony of his loss. I do not pretend that I have any words that will magically eliminate that sorrow and pain. In fact, I do not think that is what Christ wants for us today. This is not how Christ tends to work. We just heard in Mark's Gospel how the Risen Lord Jesus appeared to various persons who then went and reported these encounters to the Lord's disciples. Each time that they came to the disciples, the disciples refused to believe them. We can understand this. The disciples had seen their friend publicly humiliated and executed in an horrific manner. Death always seems so final. Death has a way of seeming to be the final word on our existence. The disciples saw the Lord die. How could he now be risen? Last Saturday night, little by little, the darkness was pushed from this chapel. At first, it was the light from the Paschal Candle, but one by one, candles being held by persons in this chapel were lighted. Soon, darkness was conquered by light. But, it happened little by little. In the Gospel we heard today, we see that the light of the Resurrection did not immediately illuminate every heart. Jesus appeared to one, two, three persons and soon, the joyful news of the resurrection was passed from one to the next until the Church filled the earth with the light of Christ. The light of Christ is, in a sense, maddening. Despite whatever sorrow or evil we encounter; no matter how deep the darkness that surrounds us, this candle still flickers. It is relentless. Even when we ourselves seek to extinguish it or run from it, it continues to shed its radiance. Darkness cannot overcome it. This was the gift that you gave to Diego when you brought him to be baptized. On that day, in his soul, the light of Faith began to flicker. I think none of us has any idea how powerful and relentless this light is in our souls. Even when we attempt to extinguish it, it maintains a powerful resistance. To me, it seems inhuman to pretend that anything we can say in this moment will eliminate the darkness that we experience at Diego's death. Instead, I propose that we keep vigil beside this Paschal Candle. Allow the light of Christ to illuminate our darkness and to help us to comprehend the full breadth of all that has happened. Little by little, the perpetual flicker of this powerful light and its capacity to be passed from one person to the next, will provide us a sure and certain confidence to live through the darkness of this hour. You will see Diego again. This is our sure and certain hope in Christ. Death is not the final word on our existence. This is the promise of this Paschal Candle. Until the Day of the Resurrection, we will continue to experience the darkness of sorrow and pain. But, the light of Christ is relentless and faithful. We are moving toward the Dawn of Glory. On that day, the radiance of the Risen Christ will cast out all darkness and in his light, we will see only light. Until then, I pray that the Faith that you were given in your own baptism, continues to burn in the midst of this darkness and illuminates your path, and that it grants to you the warmth of consolation. In his baptism, Diego was given the light of Christ. May this light--like a flickering candle--lead him and all of us through the darkness of life to the radiant glory of the Beatific Vision. Yesterday, I returned to my previous parish to offer a Nuptial Mass for a couple that I knew when they first began dating. They were part of our youth group that attended World Youth Day in 2002 in Toronto. While waiting in a three hour line for pizza, they struck up a conversation. Fourteen years later, they've begun their married life together. Here's the homily I preached. The Gospel we just heard proclaimed is not typical for a wedding Mass. That's because we find ourselves in the midst of what is called the Octave of Easter. The joy of Christ's resurrection is so abundant, that the Church cannot contain it all in a twenty-four hour period. So, the Church celebrates Easter Day for eight days. The Gospel we just heard is for Friday of the Octave of Easter. In a real sense, your marriage today is a fruit of the Resurrection. A common Gospel to hear at a Nuptial Mass is depicted in that stained glass window right over there. Jesus was invited to a wedding at Cana, and for a gift, he changed water into wine. Not bad. But, that's not the gift he's chosen to give you. For you, Jesus has chosen to give 153 large fish. Yup, that's your wedding gift from the Lord. For the rest of you lives, John Paul and Liz, remember that Christ has given you 153 large fish. Why would he give you this gift? (I'm sure that you hope nobody else gives you the same thing.) 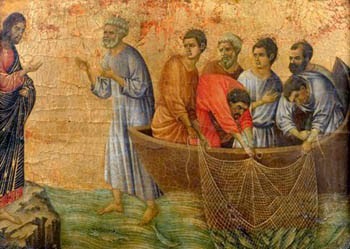 Remember, the apostles had been out fishing all night, but caught nothing. Then, they encounter the Risen Lord and obey him and their nets are filled to overflowing. In a few moments, you are going to utter words that seem impossible to the world. You are going to promise to love and honor one another--for better and for worse, in sickness and in health, for richer and for poorer, until death. These words are often discounted as mere wishful thinking or pure sentimentality. But the Church believes them. You believe them. So often, I think people are surprised when in their married life they experience worse, sicker, and poorer. They think that a marriage is only good insofar as it is better, healthier, and richer! But, as I'm sure anyone here in this congregation who is married can attest, you will experience worse, sicker, and poorer. There would really be no need of vows if it were all going to be better, healthier, and richer! These words are indeed demanding. At times, it will seem like you do not have the natural strength to fulfill them. That's okay. In those moments, remember: 153 large fish. Jesus, in the Sacrament of Marriage, gives to you all that you need to fulfill these promises. When you experience poorer, sicker, and worse, remember that you have 153 large fish. You can love one another with supernatural love. I recently read a beautiful passage from St. Paul where he speaks about reconciliation. He says that when he is the one who is offended, he is the one who seeks reconciliation. That is very beautiful, but seems humanly impossible. Similarly, in your life, when one of you feels to be the offended party, you be the one to go and reconcile. And if, at that moment, you feel incapable of such profound charity, no worries. You have 153 large fish. 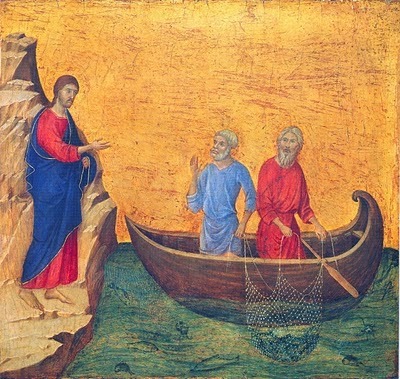 In the Gospel today, when the disciples pulled in that catch of fish, John exclaims, "It is the Lord!" JP and Liz, you met while at World Youth Day in Toronto. And you are being married on the same weekend that John Paul II is being canonized. How beautiful is that? It makes us think of your marriage, "It is the Lord!" For fourteen years or so, we've watched you come to this church each Sunday and worship God and receive the Sacraments. This makes us exclaim, "It is the Lord!" You have lived the faith that your parents handed on to you. "It is the Lord." And now, you are going to promise to love and honor each other--in good times and in bad, in sickness and in health, for richer and for poorer, for better and for worse--until death. Relying upon what God gives to you in the Sacrament that you are about to receive--relying upon the best wedding present ever--153 large fish--may all who encounter you and who witness your love for one another be able to exclaim, "It is the Lord." No long blog post here. 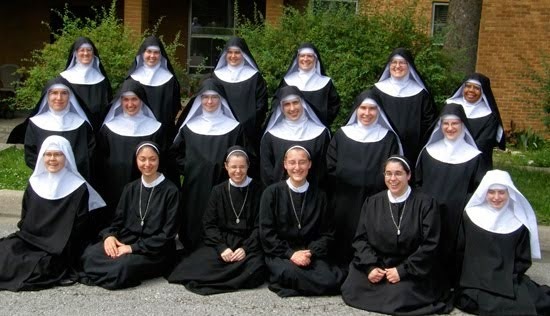 I saw this video about a beautiful group of young Benedictine Nuns and I wanted to share it. It is a cause of joy to know that there are women like this in the world. This morning, I was sitting in the chapel of the Newman Center at Boston University reading through the Resurrection accounts and through the First Book of Thessalonians. Whenever I read the Pauline letters, I feel a kinship with St. Paul. St. Paul was a pastor. He clearly loved preaching the Word and he clearly loved the people entrusted to his care. When I read St. Paul, I think of how privileged I am to share in the same ministry of being a shepherd. Today is my birthday and, not unusually, I found myself thinking about the great blessings of my life. Particularly, I was thinking about the privilege I've had of being a priest, preaching the Word, and shepherding the flock. As I pondered these things, I was struck by how all of these things were contingent upon the gift of life itself. Because I was given life, I have had the joy of experiencing life, the joy of being a priest, the joy of preaching the Word, the joy of absolving sins, commending the dying, confecting the Eucharist, baptizing, confirming, and encountering some extraordinary people. That gift of life, upon which every other thing was contingent, came to me because my Mother was faithful to the gift of life. I've rarely ever told anyone that at the beginning of my life--were it not for my Mother--my life would have been at risk. I've always considered it a topic that was best left unshared, but today as I was praying, I thought that sharing it may someday help somebody else. The short story is that at the beginning of my Mother's pregnancy with me, she was advised by a doctor to end the pregnancy. His thought was that the pregnancy was putting her health at risk and that it was likely--were I to survive--I would suffer from serious medical conditions. My Dad once said, there wasn't even a question in my my Mother's mind of doing that. My Mother says that while she was laying in her hospital bed at the old St. Margaret's Hospital for ten days after surgery, one of the nurses told her that had my Mother gone to a hospital that wasn't Catholic, they would likely have just ended things quickly and quietly. Instead, the nurses and doctor at St. Margaret's Hospital were people who faithfully lived the Gospel of Life. (For me, this is a good reason why we ought to to save and promote true Catholic Health Care). In any event, today as I'm grateful for all the things that I've enjoyed and continue to enjoy in my life; grateful for the people I've encountered, the privilege of being a priest, the joy of preaching the Word, the awesome ministry of bringing God's mercy to the repentant, the consolation of the sacraments to the dying, the Body and Blood of Christ to the faithful, and the joy of Christian friendship, I'm grateful mostly for that upon which all of these things are contingent, the Gift of Life. All the good that I've experienced in my life and any little good that I've done came because of one woman's fidelity to life. The one who was entrusted with my life from the very beginning was the true protector of that life. I'm grateful today that God put my life in such good hands. 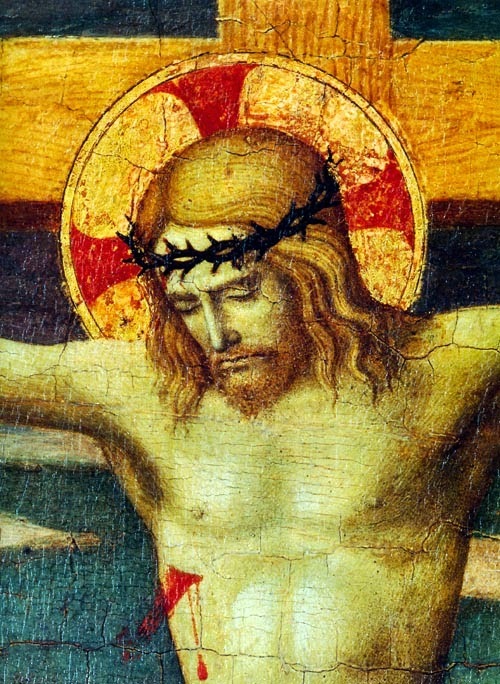 Good Friday Homily: Do You Realize What I Have Done for You? "Belief in the true Incarnation of the Son of God is the distinctive sign of Christian Faith (CCC 463)." This is what defines us as Christians, that God so loved the world, that he gave his only begotten Son. God has come close to us. Even though one would think that we would be grateful for a God who loves us so much that he became man for us, there seems to be a perpetual temptation to push God back up into the clouds, to turn Him into an abstraction, something vague and nebulous. We sometimes seem more at ease with a God who is distant and impersonal. I think this is why we sometimes find it easier to talk about "God" than to talk about "Jesus." "God" seems like a safe term. But "Jesus" or "Father" or "Holy Spirit" start sounding awfully personal. Good Friday is personal. Last night, at the Mass of the Lord's Supper, we heard Jesus ask his disciples a question after he had washed their feet. "Do you realize what I have done for you?" This is a personal question. "For YOU?" This same question ought to echo in our hearts today. Today, we ought to hear Jesus asking us, "Do you realize what I have done for you?" Do you realize that I--who knew no sin--became sin FOR YOU? I was betrayed by one whom I had chosen as a friend FOR YOU. Denied by another friend, FOR YOU. Arrested, mocked, beaten, and scourged . . . FOR YOU. I carried the weight of the Cross . . . FOR YOU. I was stripped naked and humiliated . . . FOR YOU. I endured the sorrow of my Mother seeing me humiliated and tortured . . . FOR YOU. I had thorns pressed into my head, nails driven into my hands and feet, a spear driven through my side . . . FOR YOU. I bled and died . . . FOR YOU. 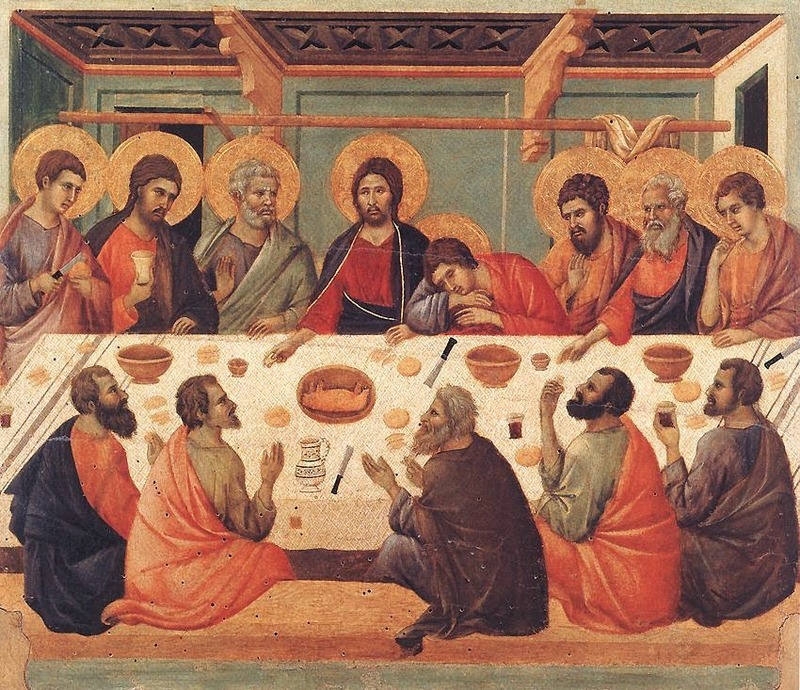 The question that Jesus asked at the Lord's Supper is so important! "Do you realize what I have done for you?" Do you realize how much I love you? Do you realize that there is nothing that I would not do for you? Do you realize that I would do anything to save you? Do you realize that there is nothing you could ever do to stop me from loving you? YOU. FOR YOU. I love YOU. In a short while, we will approach the Wood of the Cross and kiss it. May this kiss be a true act of love and devotion. May this kiss be one of sincerity and of tenderness. May it be our humble and simple response to the personal question that Jesus asks each one here today: "Do you realize what I have done for you?" The Liturgy this evening allows us to walk along the pathway of Salvation History. We have peered into the Garden where it all began. There, we recall a time before sin; a time untainted and pure. We witnessed Abraham act in a purity of Faith and become a father of many nations. We went back and passed through the Red Sea with the Hebrew people and recalled a moment in time when a people was set free from slavery. There is something about these moments in Salvation History that console and comfort us. It is good to go back. As I prepared to preach tonight, one thing from the Gospel continued to strike me. There's an earthquake, an angel declares that Jesus is risen from the dead and the big message that the angel delivers? "Go tell his disciples to meet him in Galilee." Really? And then, they meet Jesus who has RISEN FROM THE DEAD and his big message? "Go tell my brothers to go to Galilee . . . ." No offense, but this is like saying, "Go tell my brothers to go and meet me in Dorchester or Quincy." Why in the world is Galilee so important? Perhaps, and I am only wondering, is it because that is where everything began? It was there that Jesus was baptized in the Jordan by John. It was there that he changed water into wine and preached the Bread of Life discourses in Capernaum. It was there that he met Peter and Andrew, James and John by the sea. It was there that they formed their friendship, healed the sick, cast out demons, and fed the crowds. It was there that he calmed the storm on the sea. It was a time before betrayals and denials. It was a time before persecutions and crucifixion. It was a time before things went badly. In telling them to go back to Galilee, was Jesus providing the disciples a path back to grace; a path towards restoration? The power of Jesus' Resurrection--as I sang in the Exsultet--"Dispels wickedness, washes faults away, restores innocence to the fallen and joy to mourners, drives out hatred, fosters concord, and brings down the mighty." In other words, the power of the Resurrection allows us to go back to Galilee. The life of Grace is not closed off forever. All of us, have had our Galilee moments with the Lord. Times when all seemed perfect and serene. But, perhaps somewhere along the way, we have gone from the right path. Maybe we have our own failures, betrayals, and denials. Tonight, Jesus has such a beautiful message for us! "Go to Galilee and there you will see me." We can go back to the beginning because the Resurrection opens to us New Life. Tonight, Christine and Heather will have their own Galilee. In this Baptismal Font, they will begin a new life in Christ. This is their Galilee. But, after they are baptized, the Liturgy will provide for us our own opportunity to turn around and go to Galilee. We will renew our Baptismal Promises. We will return to that time and place when we rejected Satan and all his works and all his empty promises and when we began a new life in Christ. The good news for each of us tonight is that we can go back to Galilee. No matter how far we've travelled from that experience, no matter what failures, sins, betrayals, and denials have been part of our story, the way of the Resurrection leads to Galilee. This word is for all of us tonight. Let us rejoice and go to Galilee. 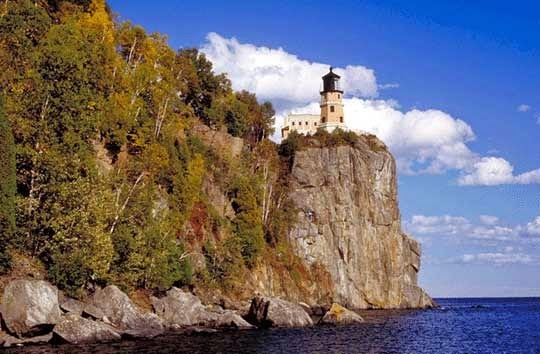 Go to Galilee and you will see him there. If I weren't so tired from the tons of things going on this week at the BU Catholic Center, I'd love to share some of these very moving experiences. It's been a beautiful week of living the Sacred Mysteries together. Really, it has been so awesome. But, I'm too wiped out to write much right now! But, I want you to watch something and share it. This will take less than two minutes of your time and, in my opinion, is just so beautiful. Check it out and if you don't mind, share it with others. Click the link below. There's probably nothing more exhausting in the life of a priest than hearing a lot of confessions. But, that's not a complaint! 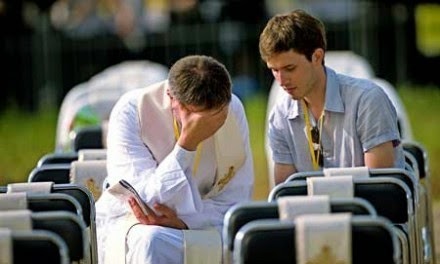 It's an exhaustion that says, "This is why I became a priest!" Tonight, I have that kind of exhaustion. This evening five brother priests and I spent two hours hearing confessions at Boston University. It is just so awesome to see so many young people lining up to come to confession and receive God's mercy. Man, it is so beautiful. From my seat in the sanctuary where I was hearing confessions, I looked around and was so grateful for a truly ecclesial experience. We talk a lot these days about the Church needing to evangelize. When we say that, it means an evangelization that engages all of the Church's members. Let me tell you what I experienced tonight. I'm there hearing confessions of college students; lots of college students. They're coming to me and I get to speak the words of absolution over them. All around me, I see these other priests doing the same thing. After their own full days, they made their way into Boston to help me out and to exercise the ministry of mercy. For two hours, one penitent after another poured out their souls to them. But, this was not just the work of priests. Yes, we priests have this great privilege to hear confessions and absolve sinners. But, we were being supported there by the whole Church. The evening of confessions was organized by a committee of students. They get the whole thing going. They were there assisting students and directing them. Our FOCUS Missionaries have been out on campus all week inviting people to come to confession. They were emailing, calling, texting, and personally inviting students to confession. Our interns and music ministers were there to assist, pray, and organize. Some of our students just sat in the chapel and prayed during the time of confessions. Students posted on Facebook and Twitter about the confession time and place. All of this in order to help young people to encounter Christ in his Mercy. But that isn't all. All of these young people who encountered the mercy of Christ tonight benefited from those who donate to our Newman Center. Those who support us make it possible for us to bring the sacraments to these students. I think also of parish priests, parents, and parishioners who helped these young people and taught them about Christ and the Sacraments. They too were part of what happened tonight. I thank all of them. Tonight, I am grateful for all of these people who helped young men and woman to receive the grace of new life from Christ. This, to me, is what the Church is all about. We are all in this together. We are in this in order to allow Christ to reach the people of today. The zeal and dedication of so many Catholics tonight made it possible for many people to encounter Christ. This is everything! This is the whole thing! I am especially impressed by how filled with charity the Catholic students at Boston University are for their brothers and sisters. In the midst of their own busy life, they pulled out all of the stops to help their fellow students to go to confession. What beautiful charity! These Catholic students want others to share in the joy of the Gospel, to experience the tenderness and mercy of the Sacraments, and to know the consolation of truly belonging to Christ and to His Church. Sometimes, I look at these young people and I wonder, "Where did they get all of this?" It's truly God's grace at work. They are missionaries who carry with them a joy and attractiveness that is the hallmark of the Gospel. Although it is the singular privilege of the priest to hear confessions and to impart absolution, I hope that the young people who tonight brought others face to face with the Mercy of God have some share also in the beautiful exhaustion and profound gratitude that I feel tonight. The exhaustion of mercy is so awesome and these young evangelizers deserve to share in it. The Pope said something today that made me really happy. He's not the first to have said things like this. In fact, Pope Benedict XVI often spoke similarly. But, Pope Francis speaks in a bit more earthy a manner. This is a good reminder to everyone about who the priest is. There is a real temptation to professionalize the priesthood and attempt to transform it into something more mundane. This advice to seminarians, given by the Pope, attempts to counteract this tendency. Priesthood is messy. If you live close to the people, it gets messy. The priesthood created by committee attempts to avoid all messiness. It turns the priest into somebody who keeps a safe distance from the lives of people, somebody who is detached from their experience, somebody remote and clinical. It's a priesthood that fills out reports about people whom the priest really does not know. Tonight, as I was sitting in Eucharistic Adoration with about thirty college students, I was thinking about how blessed I am to be close to them. I don't mean that they are blessed that I am close to them. I mean that I am blessed to be close to them. I am still growing in my in my priesthood, in my discipleship, and in my manhood. I presume that the way to grow in my life is to be close to the people whom Jesus has called me to shepherd. This closeness not only (I hope) benefits them, but it benefits me. This closeness is such a profoundly joyful experience in my life. If I did not have this closeness with them, I feel as though I would only love them in some abstract and theoretical way. The way in which I am called to draw closer to Christ is through my love for the people to whom he sends me. If I were remote from them, I would be far from Christ. These words of the Pope really struck me and renewed in me a gratitude for my vocation and a gratitude for the people whom he places at my side, people who teach me every day what it means to be a shepherd. Some of my most vivid memories from boyhood revolve around Holy Week. I can recall attending the Sacred Triduum with my family, my brothers serving as the Altar Boys. When I was finally old enough, I too would be on the altar for those liturgies. One thing that particularly stands out for me is the reading of the Passion on Palm Sunday and again on Good Friday. As you may recall, many parishes involve the congregation in the Passion by having them assume lines from the mobs. What I vividly recall is the great gusto with which my Mother took her role as a member of the crowd. 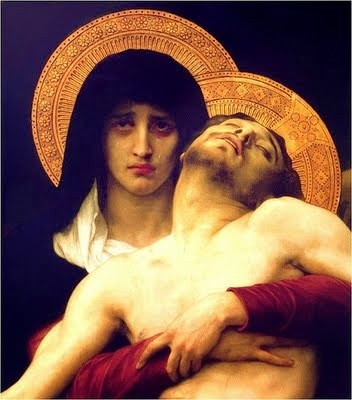 It is a bit jarring to hear your mother calling for the crucifixion of the Lord. "Crucify him!" "We want Barabbas!" This memory, however, remains with me as something quite positive. It reminds me of something important. The people who denied Jesus, betrayed Jesus, humiliated Jesus, scourged Jesus, unjustly condemned Jesus, chose Barabbas over Jesus, mocked Jesus, who crucified Jesus, and those who remained faithful to Jesus . . . all of them . . . were people just like us. They were people like my Mother, people like my Father, people like my brothers, people like my friends, people like me. Christ was in front of them and they made a decision as to how they would relate to him. During the reading of the Passion at Palm Sunday Mass this year, I was particularly struck by the disciples who fell asleep on Jesus. This must have been a big suffering for Jesus. Here he is about to offer the most tremendous act of love and endure incomprehensible suffering and the friends he has chosen to be with him in this moment fall asleep on him. It must have increased in Jesus a sense of isolation and abandonment. Those disciples . . . just like us. We can be people who fall asleep in front of the love of God. Asleep in ingratitude, asleep in distraction, asleep in the face of injustice, suffering, and pain. In front of what is most real, true, good, and beautiful, we can just yawn and fall asleep in the mundane. All of us relate to Christ in one way or another. This is the great mystery. Our whole life is judged upon our relationship to Him. Ignoring him, denying him, resisting him, betraying him, following him, loving him; these are all possibilities. In Christ, God's love has become flesh. Our position before Christ is our position before God's love. God's love is a fact. It is a fact who has become flesh and who has hung upon a Cross. All of us are in a relationship to this Fact in one way or another. We can betray this love, deny this love, ignore this love, yawn in front of this love, be moved to repentance by this love, follow this love, love this love, open ourselves to this love, be transformed by this love. But, the one thing we cannot do is not be loved by this love. The people in the Gospels were people like us. They were loved by God and, in one way or another, they responded to this love. This Love--this Crucified Love--stands at the center of human history and awaits our reply. Five times a day, priests are required to pray the Divine Office, which contains, among other things--a four week cycle of psalms. Day in and day out, week in and week out, year in and year out, it's the psalms. It is always amazing to me how after eight years in the seminary and seventeen years as a priest, I still have, "Gee, I never really noticed that line before" moments. Or, "I never really thought about that line before" moments. It's one of the beautiful things about the Liturgy. Every year, the liturgy goes through the same calendar and we do the same things on the same day, but discover newness within it. Take Lent, for instance. Every year, forty days of fasting, prayer, and almsgiving. I love the fact that we don't try to become more contemporary when it comes to Lent. The Church never says, "You know, maybe there are better ways of becoming holy. This year, let's forget about fasting, prayer, and charity and instead let's focus on other important things." Nope. Fasting. Prayer. Almsgiving. 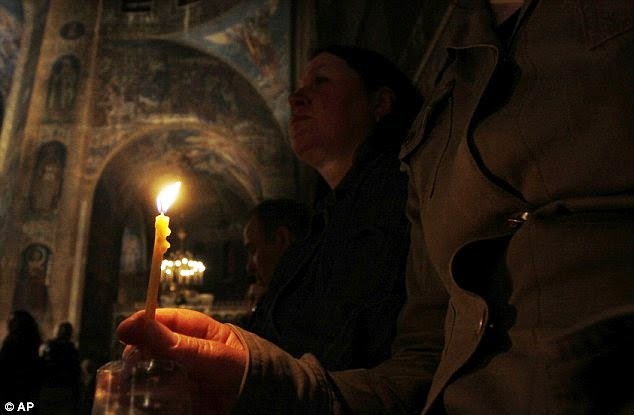 Lent, two thousand years of fasting, prayer, and almsgiving. This year, I've had the best Lent I've had in a long time. That's not because it was without its occasional failures, burdens, or trials. It actually had plenty of those. Lent was great because it was spent close to Jesus and close to His people. What was particularly beneficial was spending an hour each day in Eucharistic Adoration. It was awesome. It was also awesome because most of those days, I was joined in that time of adoration with others. That time of adoration was so fruitful. Spending time before the Blessed Sacrament is awesome. Spending time before the Blessed Sacrament with friends is awesome. Getting hungry while fasting is kind of the point. It's what supposed to happen. Relax. The Scriptures are so awesome. What you ask the Father in Jesus' name, he will give you. What others can intend for evil, God can intend for good. Everything the Church teaches is true. This evening I got to give a brief homily at the seminary for its penance service. The Gospel for the service was Matthew 18:21-35. Brothers, in a week's time, we will approach and venerate the Wood of the Cross, upon which hung the Savior of the world. Tonight we are afforded an opportunity to be certain that what we venerate with our lips next week, we also venerate within our hearts. At our ordination, we hear the mandate to "Conform your life to the Mystery of the Lord's Cross." We who will spend our whole life being ministers of God's mercy--a mercy that comes to us from the wounded side of the Crucified Christ--must also be men of mercy; men who show mercy; men who are conformed to the mystery of the Lord's Cross. St. Peter knows that mercy requires a wound; that mercy is painful. This is why he poses the question in tonight's Gospel. "How many times must I forgive my brother who wounds me?" Seventy times seven times is a lot of wounds. It is also a lot of mercy. St. Paul knew that mercy passes through wounds. In writing to the Corinthians St. Paul says, "When reviled, we bless; when persecuted, we endure; when slandered, we try to conciliate; we have become and are now as though the refuse of the world, the dregs of all things." (Put that on a vocations poster). St. Paul, wounded repeatedly, conformed his life to the mystery of the Lord's Cross and allowed mercy to pour from his wounds. Forgiving those who wound us is difficult, but there are no loopholes in the Gospel when it comes to loving and forgiving those who injure us. Believe me, I've looked and there are no loopholes. In a beautiful sermon on this Gospel passage, St. John Chrysostom says that when a brother wounds us, we ought to rejoice for ourselves and weep for our brother. The more we are wounded, the more we are able to become like Jesus Christ who from the Cross forgave those who inflicted suffering upon him. We ought to rejoice, says Chrysostom, because we are afforded the opportunity to show mercy. But, says Chrysostom, we ought to weep for the one who injured us because that one has grown more distant from God. Chrysostom says what we must never do is to drive the sword of hatred and vengeance into our own heart. We think that this sword is directed at our foe, but really it pierces our own heart. Brothers, as we draw near to kiss the Wood of the Cross, let us not be like Judas whose kiss was a mockery. Instead, let us conform our life to the Mystery of that Cross. The mercy of God comes to us through the wounded side of Christ. No wound, no mercy. When we are wounded by our brother, let us conform our life to the mystery of the Lord's Cross. Let us who are called to be ministers of mercy also be men of mercy, men after the heart of Christ; men who from our wounds pour out mercy seventy times seven times. There is a virtue that belongs specifically to the priest. It is called, "pastoral charity." This particular form of charity arises from the priest's union with Christ as Head and Shepherd of the Church. Through this virtue, the people experience the love of the Good Shepherd through the instrumentality of the shepherd who stands in their midst and exercises priestly ministry. 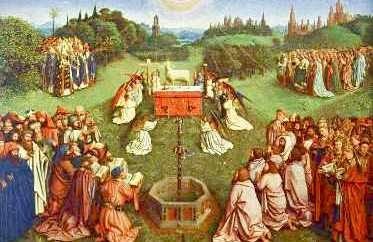 Through this virtue, the priest feeds the flock, guides the flock, tends the injured sheep with the balm of sacramental mercy and unction, seeks out the lost sheep, and lays down his life for the sheep. The priest, however, is not a hired hand. If the priesthood were reduced simply to hired hands whose function was to perform certain duties or fill certain slots, then we would lose something significant. Often enough, you hear it said that priests should be better trained in all manner of activities. Cooking, maintenance, finances, human resources, and the list goes on. These are all things that certainly could be beneficial in the life of a priest. But they ought never become primary. These are the types of things that could easily become idols, replacing the true dignity of the priesthood. In my experience, the people are enormously forgiving of their priest's shortcomings in terms of natural talents in specific areas. What the people most want in their priests is to experience the love of Christ the Good Shepherd. There is something beautiful to me that this love is not something that the priest gives to himself, can stir up in himself, or can gain through pure willing it. It is something that is given by Another. This virtue is poured into the priest from the Heart of Christ. The priest, in a sense, is a vessel for this pastoral love, a fragile clay jar that holds a heavenly treasure. This is not to say that a priest can be devoid of the necessary human, intellectual, and spiritual attributes that make him fit for ministry. But, it is to say that what is most important about a priest is not is natural capacities, but rather the supernatural love that has been poured into his heart by Christ. When I think about my life as a priest, it is not my particular gifts or talents that have been most effective in pastoral ministry. Certainly, whatever limited natural strengths I have are useful for the pastoral ministry. But, it is the love that has been poured into my heart by Christ that has been the most effective in terms of pastoral fruitfulness. Any natural talent that I might possess is only helpful to the pastoral ministry insofar as those talents are vivified by a supernatural pastoral charity. This is both awesome and humbling. It is awesome because it shows that Christ uses me as his instrument. It is humbling because it means that being an effective priest means to be totally dependent upon Christ and not upon anything that I bring to the table. More beautiful to me in all of this is the way in which the People of God respond to this reality. When a priest loves his people with true pastoral charity (meaning, the charity of a shepherd), the people do not demand or expect the priest to be perfect in every way. My experience of being a priest has shown that the faithful--be they parishioners or young college students--come to the aid of my weaknesses. The faithful supply everything else that is needed. They only want the priest to supply what no one else can supply, the heart of a shepherd. And of course, the priest really doesn't supply this on his own. He can only accept this heart from the true Shepherd. Among my favorite lines in the Psalms is, "He has put into my heart a marvelous love for the faithful ones who dwell in his land" (Psalm 16). This love is something that wells up within me at times. It is a love that is mine by grace and not by nature. It is a love that is met with reciprocity by the faithful ones who dwell in the land. When the priest accepts from Christ this pastoral love and the people respond by loving him in return, something very beautiful happens. Something awesome happens. Today, I was reminded on a few occasions of where I find certitude. I need certitude in my life. Experience shows that I do not find certitude from my own talents or strength, nor I do not find certitude in the strengths, talents, and decisions of others. But, I do find certitude in the marvelous love he has put into my heart for his faithful ones. I find certitude in this great bond of love between this shepherd and Christ's faithful. Even in the life of the Church, there is plenty of real estate made out of sand. Building on sand never gives us certitude. Instead, I am reminded that I need to build upon rock. Wherever the love of Christ is present--even though it comes in jars of clay--that is the place of certitude for me. He has put into my heart a marvelous love for his faithful ones and, thanks be to God, again and again he has given me certitude through their love. May Jesus Christ be praised. I stole something and I'm not sorry for it. I stole big. I stole really big. This weekend, I stole my homily material from St. Augustine. It was just so good that I couldn't help myself. I'm happy to say that I think Augustine would be edified that some 1600 years after his death, university students in Boston are still learning from his teaching. In commenting on the raising of Lazarus, Augustine notes that the gospels record three times that Jesus raised somebody from the dead. There was the young daughter of Jairus who died in her house. There was the young man whose body, accompanied by his mourning mother, was being transported outside the gates of the city to his tomb. And, then there was Lazarus. Augustine says that each of these situations has something to teach us. Jesus, the Gospels tell us, came to the bedside of the young dead girl who was "in the house." Augustine says that her place within the house reminds us of those who have committed sins in their minds and in their hearts. Perhaps through hatred, lust, or envy (or many other sins), we can sin inside the house of our very self. We may not act outwardly on these things, but internally, we have consented to them. And, in consenting to them, we have died. In raising the young girl, Jesus reminds all of us who have sinned in this way, that he can bring us to new life. The young man was being carried outside the gates of the city. In this way, we can ponder those times when we have committed sins outside of ourselves. These are sins that not just were inside our hearts and minds, but sins we acted upon. Sins of calumny, gossip, the flesh, violence, indifference to the poor, and many other sins done on the outside. Again, Jesus raises this man and so teaches us that we who have died in our souls by such actions can be raised and come to new life. Lastly, we have Lazarus. Today's gospel is not "too high in the sky." It is earthy. Martha says, "Lord, don't roll back that stone. Ol' Lazarus has been in that tomb for four days. That is going to be one horrendous stench." Lazarus wasn't just dead. He was really really dead. He was stinky dead. 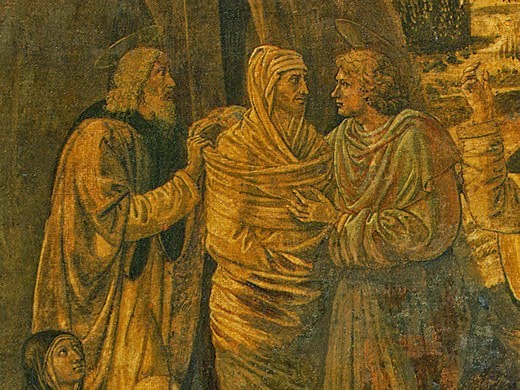 In this way, says Augustine, Lazarus foreshadows all of those who have become immersed in sin. He foreshadows those trapped in habitual sin; those who seem beyond any possible hope. Lazarus wasn't dead for an hour or so and in need of some really special CPR. He was dead and in a tomb for four days. He wasn't getting better any time soon. When we become immersed in some sort of sin and dwell in sin, we can feel like Lazarus: Dead, filled with stench, buried away, beyond all hope. Ah, but Christ comes into this situation and raises Lazarus. No one is beyond the mercy of God. No one should despair. Today, Christ calls to all of us who have perhaps sinned on the inside, on the outside, or have become habituated in sin. His mercy reaches even to those whose souls seem beyond all reach. Do you feel dead? Rancid? Beyond help? Welcome to Lazarus' world. Lazarus, however, was raised. The Gospels are not primarily filled with people who were perfect. They are filled with people who encountered Christ and were transformed by him. The Gospel ended today by saying that many who were there that day came to believe in Jesus. The most effective evangelization is our own conversion. Imagine being at a cocktail party with Lazarus after all of this. Talk about a good story. "Yeah, I had an interesting thing happen to me. I was dead for four days and they had buried me. Then Jesus came and raised me up." Now, that's an interesting story! The Church is filled with people who were dead and are now alive in Christ. This is what it is all about. We want to spend our whole life telling people that we were dead and Jesus entered into our stench and brought us back to life. I'd like you all to take your phones out right now. No, I mean it. Take them out. Don't check Facebook or read your messages. Just go to your calendar and open it to April 15th. That's tax day. That's the day you have to render unto Caesar what belongs to Caesar. But, we also have to render unto God what belongs to God. And God wants our sins. On April 15th, from 7-9pm, we will have a bunch of priests here available for confession. So, I want you to write "Confession" on that date and then put one of those little alert things on it, so you don't forget. Jesus raised Lazarus because he loved Lazarus and his sisters. But, he loves us too and he wants to raise us to new life. Whether we have only sinned inside, or whether we've sinned outside, or whether we are immersed in the darkness and stench of habitual sin, we are not beyond Christ's mercy. Don't give up on yourself. Jesus is weeping and calling out for you. He's calling out to us. Let's be given new life by him and through our conversion, may many others come to believe in him. Oftentimes, when a priest is ordained, he prints up prayer cards with some passage from scripture or from a saint to commemorate the event. When I was ordained, I chose the last two verses of St. Matthew's Gospel: "Go therefore, and make disciples of all nations, baptizing the in the Name of the Father, and of the Son, and of the Holy Spirit, teaching the all that I have commanded you. And behold, I am with you always . . . (Matthew 28:19-20). 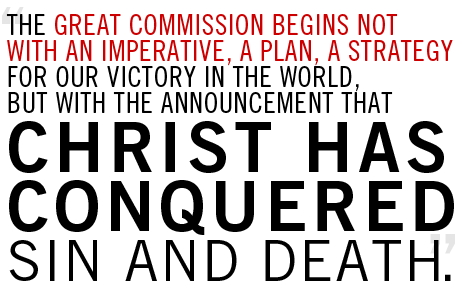 For me, these words contain everything that the Church is. It's all there. Trinitarian, sacramental, One, Holy, Catholic, Apostolic, discipleship, Merciful, Eucharistic, missionary, doctrinal, communion, the abiding presence of Christ, and evangelical. The key, of course, to this great commissioning is that it arises from the Heart of Christ. The mission and the identity of the Church is not something that we develop. It is something given by Christ. It is something that is given in every age and in every place. It is something that is manifested in particular places and times in varied ways. It is animated by the power of the Holy Spirit who blows where he wills. The mission of the Church is not something we determine for ourselves, but rather is something given to us by Another. While the mission of the Church is, in one sense, always the same, it also has a certain flexibility in terms of emphasis. A good example might be the differences we see between the pontificates of Pope Benedict XVI and Pope Francis. In Pope Benedict's pontificate there was some emphasis placed upon the dignity of the Liturgy. This didn't exclude the missionary nature of the Church nor its focus on the poor, but it was a different emphasis. Now, with Pope Francis, there appears to be less emphasis on the Liturgy and more emphasis on charity toward the poor. The Church is able to navigate such shifts in emphasis because its mission is not dependent upon each new pope. 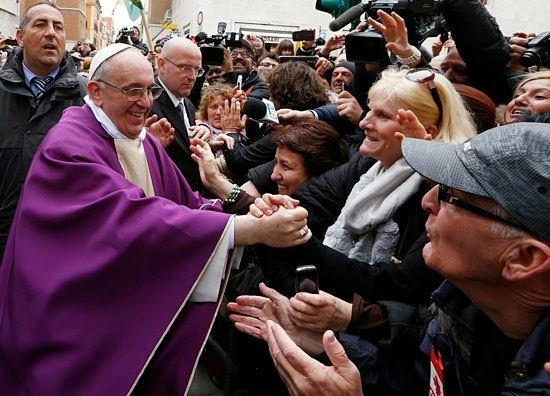 Each pope may emphasize a particular aspect of the whole mission, but the Church's mission is given by Christ. Although parishes benefit greatly from the expertise of various fields of business, law, communications, and other such areas of life, we still have to be cautious about adopting things that can serve to undermine the distinctive nature of ecclesial realities. One such model often brings with it the idea of each parish self-identifying itself through mission statements. The risk with this is that a parish can become like a club setting up its own identity. "We are the parish of social justice." "We are the parish of good Liturgy." "We are the welcoming parish." "We are the parish that focuses on adult education." "We are the parish that thinks the Bible is a good thing." This method seems to solidify particular aspects of the mission given by Christ into a permanent totality and the only way to change that is to go through another mission writing process or to ignore the mission statement. The issue of mission statements (and similar corporate approaches) also raises, I think, a question in regards to pastoral authority. Does a parish's particular mission statement die with the pastor? After all, the pastor is the one responsible for shepherding the parish. Each pastor--in cooperation with consultative bodies within the parish--ultimately is responsible for setting the course of the parish. Relying upon the grace of Holy Orders, the pastor shepherds the flock. While a previous mission statement might be of some guidance, the mission statement would have been the work of a previous pastor. It would seem then that mission statements are less about the parish than they are about the pastor who approves the mission statement. Obviously mission statements and things of this nature have no binding authority on a pastor or a parish, but they can give the appearance of being a quasi-permanent definition of this particular parish. This could run the risk of stifling the work of the Holy Spirit. If we are the parish that emphasizes Adult Education, what if the Spirit is moving us to become the parish that emphasizes service to the poor? Do we need a new mission statement? Do we resist this movement as being inconsistent with our mission statement? I grant that these questions are a bit silly, but it raises some questions about the value of such efforts. The Church really only has one mission. 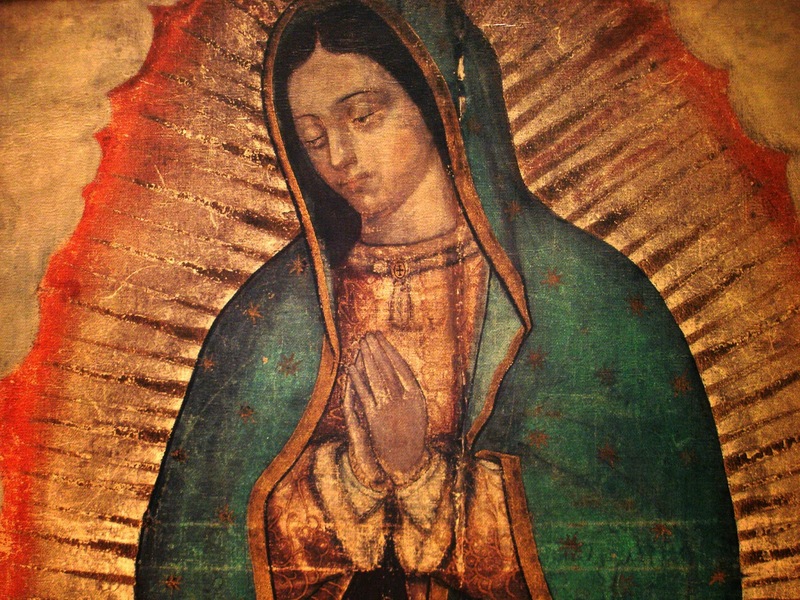 It is the mission entrusted to her by Jesus Christ. 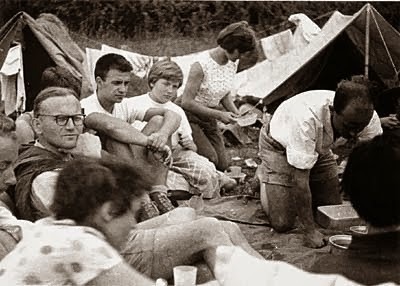 Unlike religious orders with particular charisms or Catholic Hospitals and Campus Ministry programs that are entrusted with very specific aspects of the total mission, parishes are more like microcosms of the universal Church--entrusted with the totality of the mission--and need to be flexible enough to read the signs of the times and react according to the Spirit's promptings. In exercising his pastoral mission, a pastor does not need to appeal to a static statement written at a particular moment in time and in particular circumstances. Instead, a pastor has the joy and comfort of appealing to the Shepherd to whom he is configured and to the people with whom he lives. Relying upon this closeness to both the Shepherd and the Faithful, the pastor can determine the best way to lead his flock in fulfilling the mission entrusted to them by Christ. This closeness is not something static. 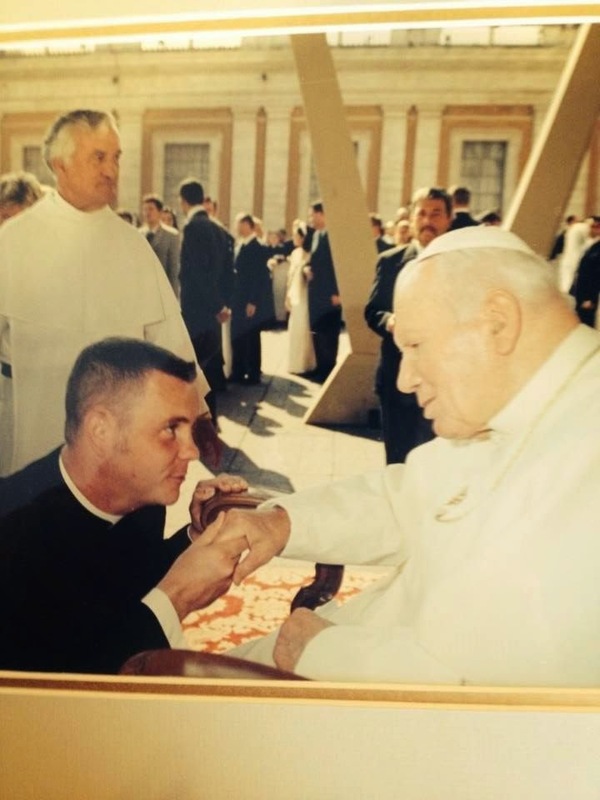 This closeness to Christ and to the people entrusted to the care of the priest is something that is constantly renewed and always deepening and growing. Through ordination, the priest is configured to Christ as Head and Shepherd. This configuration is trustworthy and gives the priest what is uniquely necessary to direct a parish. It also works. The Mission of the Church doesn't change. It was given once and for all by Christ. In the day to day living out of that mission in each parish, there needs to be an incredible amount of flexibility. A good pastor knows how to live this flexibility. Parishes will more effectively become centers of the New Evangelization the more that the bonds established by Christ are deepened; the bond between the pastor and Christ the Head and Shepherd, the bond between the Faithful and Christ, and the bond between the Faithful and their priests.